Whether it is a cup of coffee or a cup of tea, people drink it all the time. And every time they drink it, there is a story coming with it. Some people like to drink it alone, to taste it while thinking about their own little world with their big problems. Other people like to gather and socialize in the morning at work, holding a hot cup of coffee and a cigarette. Either way, this old habit of drinking tea or coffee is always full of emotions, always meaning-full. This is probably the reason why the good old cup of beverage has been photographed over and over again. Pictures representing the morning coffee or tea have gone viral. Because EVERYONE is drinking a cup. It might be bitter, with sugar, with or without milk, but it’s a daily habit. Why not make a photographic story out of a daily habit that millions of people have in common? In this article, I will start by showing you examples in order to trigger some ideas in your head, and then, I will talk about the actual process of taking a photo of a coffee cup. What makes the difference between the many photographs out there, is the mood that theses inspire. Another highly photographed scene involving a coffee, is the art of shaping the foam on top of the coffee. The possibilities here are endless. Oh, and by the way, if you are interested in finding out more about the coffee foam art, check out the latest, most incredible coffee foam art by Kazuki Yamamoto. Coffee + a person drinking it. Don’t forget: every picture tells a story. I choose to show you different kind of scenes, with people of all ages, alone or in a group. 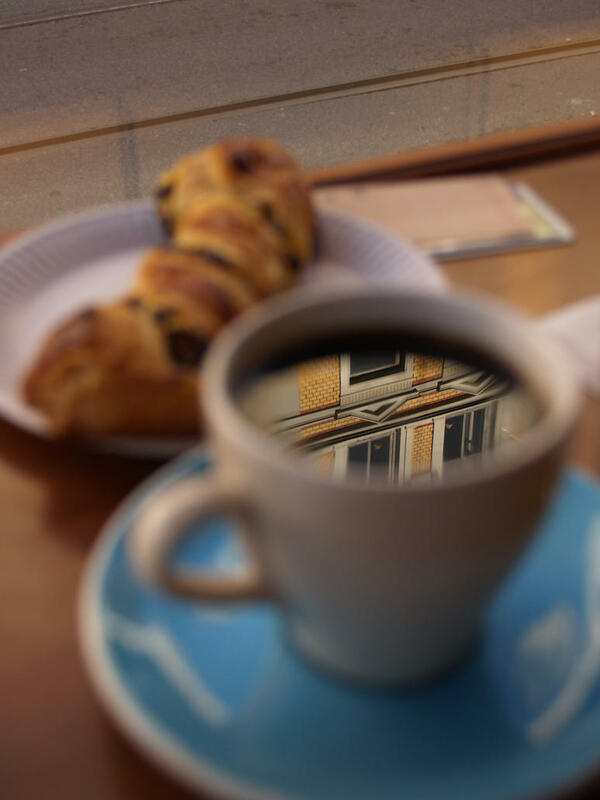 If you are wondering what to do with your cup of coffee, how can you monetize a picture of it, let me tell you that I have seen a lot of book covers that use an image of a coffee cup. It’s universal. Or, your local coffee shop might need some promotional materials and your pictures might come in handy. Now, let’s see how to replicate the technical details of the above examples. The first thing you notice, is that these images don’t have a lot of colors. Most of them have a clear brownish tint, while others were converted to sepia tone completely. In order to obtain the best quality image, you will need to create an environment that is mainly formed by warm colors. Another thing you need to put on the priority list, is the contrast of your picture. Most good-looking pictures of coffee cups have a white colored cup. Why? Because the coffee itself is dark-colored. So, in the end, most of the above pictures have this contrast pattern: dark background – white cup – dark coffee. An advantage of the dark background is the fact that it allows you to capture the steam raising from the hot coffee. You can accent the steam a little with a powered down fill flash and a diffuser. Ah, and… one more thing: make sure the coffee cup looks clean, without unaesthetic stains. Next in line, is the aperture. Again, most of the shots have a narrow depth of field because the focus is on the cup, and the background must be only a splash of color. If you have other artistic elements in the picture, such as a cinnamon roll, or a book, or eye glasses, then you have to make sure these are also captured in the focused area. (However, don’t overload the scene with too many elements. You need to keep the attention on the cup and avoid distractions.) In this case, it’s best to have the scene set far away from the wall, in order to obtained a blurred background. 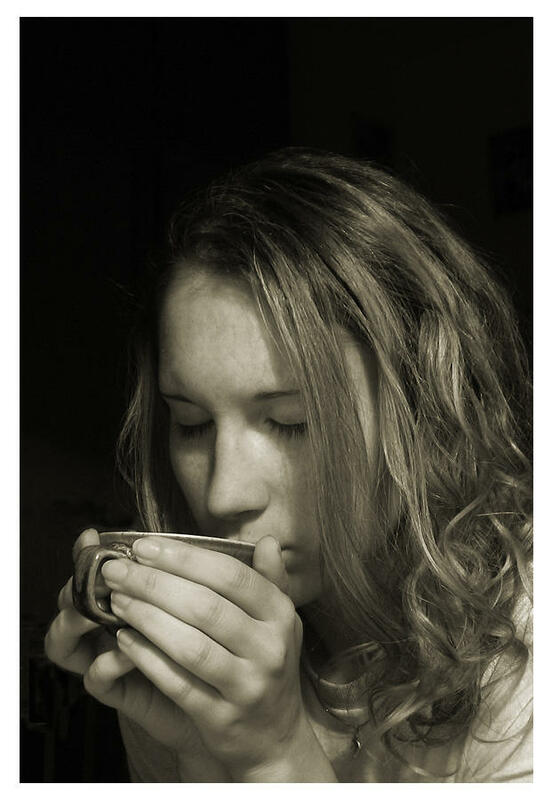 When you photograph a person drinking from a cup, then you can enlarge your depth of field, and follow the usual rules that apply to portrait photography. For a more in-deep tutorial on how to shoot a cup of coffee in the studio, watch the below video. Here you will find out about the proper lighting in coffee photography.